As with Presbyterians, first preaching of the Wesleyan gospel came to Niagara and Lincoln from the American side of the border. George Neal was a soldier in the Revolutionary war, rising to the rank of major. He was an ardent Methodist, subsequently ordained by Bishop Asbury of the Methodist Episcopal Church. His defiance of a ban by the officer commanding the British at Queenston is rightly regarding as among the earliest beginnings of non-conformation in Niagara. 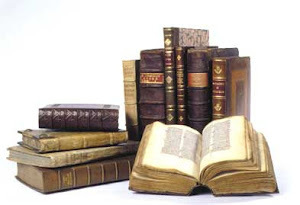 The religion preached by the “saddlebag” ministers who followed was straightforward and bunt, with no tendency to observe the polite mannerisms when discussing other denominations. Ecumenism was a word unknown. Rev. Jacob Mountain, Bishop of Quebec, commented briefly on Niagara after a trip from Montreal to detroit by batteau: “there are a few Methodists of the worst description wandering around the cuntry” was his summation of the state of non-conformation in the peninsula. Rev. Darius Dunham, first ordined minister appointed to the Niagara Circuit by the American Methodist Episcopal Church, found about 65 of the faithful and held the first Quarterly Meeting. In 1796 the home of Christopher Culp, by the lakshore, became a centre of spiritual life for area Methodists, and Culp’s children and grandchildren registered a strong impact upon the church. Three granddaughters married Methodist Episcopal ministers and one of his sons, Rev. David Culp, erected the first Methodist Church in Toronto. In this work he was associated with Rev. Henry Ryan who mortgaged his farm on the banks of the Twenty in Gainsborough. 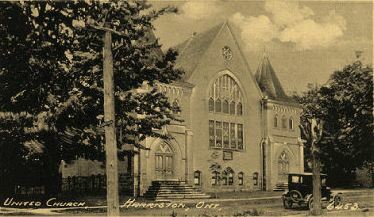 The church they built was a forerunner of the present Metropolitan United Church. As with the Baptists and the Presbyterians, the War of 1812-1814 imposed severe strains and disaffections toward ministers from across the border. In the case of the Methodists, appeals were made for volunteers from English Methodists. The year 1821 saw the work of the American Methodists pass to the church from the Mother Country. In 1830 Rev. Henry Ryan led a dissident group at the Thirty and formed the Canadian Wesleyan Methodist Church. By the time of Ryan’s death, 1833, there were 1,915 members, including those at the small church at the Thirty, built some 200 yards east of the other Methodist Church. After Ryan’s death his splinter group failed to prosper and eventually merged with the Methodist New Connexion Church. 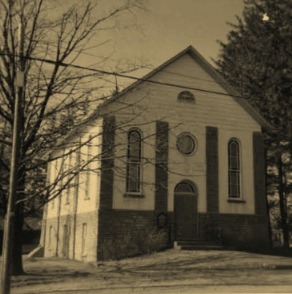 The settlement at the Thirty, sometimes called “Johnstown”, built one of the earliest Methodist churches. John Beam, son of Jacob, joined Nathanel Griffin in erecting a meeting house where preaching was conducted every three or four weeks by circuit riders. One of the high spots in the life of the congregatons was the preaching visit of Rev. Egerton Ryerson, of York, on Easter Sunday, 1825. After the union of Wesleyan with the New Conexxionists in 1841 the congregations built a new brick church at the Thirty in 1850, deed to the land given by John Beam. The Thirty appointment was part of the Grimsby circuit until 1874 when it became attached to the Beamsville charge. In 1888 the Thirty appointment was closed, though preaching took place there occasionally. The life of the church was largely inspired and carried on by a strong Ladies Aid Society. The end came after World War II when Lincoln County Council purchased the disused church and removed the old brick building in a road straightening project. The Lakeshore Church on what is now Maple Grove Road was built on land deeded by Ira F. Culp in 1858. 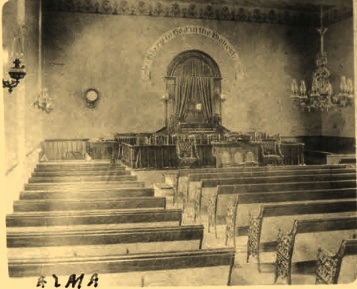 The frame church, one of five on the Smithville circuit, had preaching every two weeks. 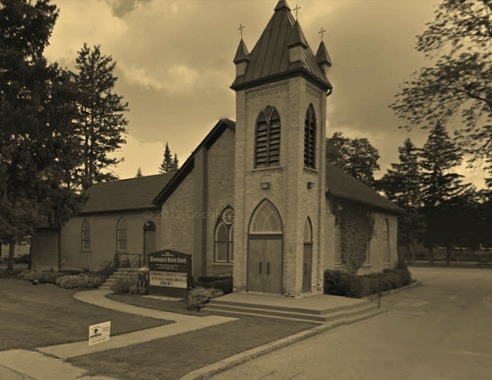 In 1884, amalgamation of Methodist groups in Canada saw a re-alignment of circuits and Lakeshore became associated with Beamsville.Changing travel patterns with the widespread use of the automobile resulted in closure of the little church durng the ministry of Rev. A.W. Shepperson, 1918-21 , the building and property reverting to the Culp family. At Jordan Station (“Bridgeport” until 1875) Solomon Secord deeded half an acre of his property to the Wesleyan Methodists for the building of what eventually became Jordan Station United Church. The deed was dated Christmas Day, 1859, and the cost was 60 cents. 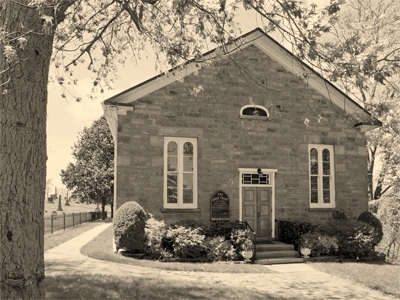 There was a New Connexion Methodist Church in Jordan and the 1874 union of the congregations strengthened the Methodist cause at Jordan Station, the church served by the minister at Beamsville. An addition was built, at a cost of $600, in 1878. During the period 1886-88 Jordan Station was part of the Tintern-Jordan Station-Silverdale-Lane’s circuit and the relative strengths of the charges may be gauged by the apportionment of the minister’s salary, $600 plus $50 for rent. Tintern paid $225, Jordan Station $150, Silverdale $141 and Lane’s Church on the Twenty Road $131.The Jordan Station congregation was growing in strength, however, and building additions to the church, plus Sunday School accomodation and a commodious drive shed. By 1898 Tintern and Jordan became one circuit, with Jordan Station having outpaced Tintern to the extent of four stewards to three. Two years later this strength was emphasized when the circuit’s name was changed from Tintern to Jordan Station. In 1912 the circuit became self-supporting and during the period 1915-17 Jordan Station became a single charge, begining of the modern era for the congregation. Major renovations to the church building were undertaken in 1928. At Tintern a small band of New Conexxion Methodists worshiped in their old Zion Church – known locally as the “Old Mud Creek Church” or the “Johnson Church” – while the Wesleyans attended their own church nearby. Union of the two branches and the building of a new church at Tintern resulted in a strong congregation, the new edifice dedicated in 1874. Tintern became a charge on the Beamsville circuit a year later, and of the Jordan Station circuit in 1883. From 1915 until 1947 it was aligned with the small Eden Church on Spring Creek Road, through services had not been held regularly at that church for many years. A marble tablet fixed to the wall of Tintern Church is an historical reminder of one of the congregation’s most devout members. “A.D. 1857” the tablet is headed. “This mill erected by Andrew Dean for the good of Man, and he consecrates the tenth of all the proceeds, to the support of spreading the Gospel of Christ on earth.” Dean, who bult the big stone mill on the Twenty, was a member of the New Connexion Methodists at Tintern. 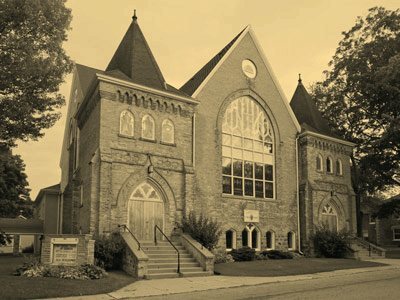 First members of the board of the United Methodist Church at Tintern were, Tilman R. Houser, Jacob Fry, Daniel Honsberger, John Moore, Jacob Michener, (grandfather of Governor General Roland Michener), Andrew Dean and F.H. Moyer. Eden Church on Spring Creek Road was founded as a Methodist Church in 1888, dedicated in that year by Rev. Dr. Albert Carman, General Superintendent of the Methodist Church. Eden was associated with the Smithville charge until 1910 when its people were served by the pastor of the Evangelical United Brethern Church at Campden. In 1915 it became part of the Tintern charge. The Methodists of Tintern had been part of the Beamsville circuit for a short period. 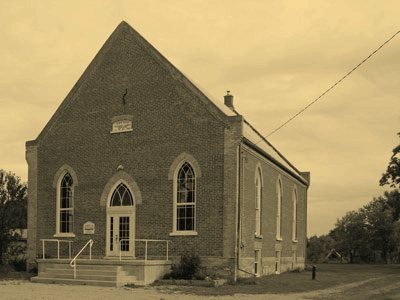 In Beamsville, Methodism was one of the community’s hallmarks since the first mission church was built in 1835. Rev. Richard Phelps, a native of New York State, is credited as the moving spirit behind the building of the church, part of the Grimsby circuit. By 1869 the church had been refitted and the connection with Grimsby ended,the Lakeshore church becoming the second preaching place for the circuit. In 1883 the congregation had grown to 170 members and an impressive twin-spired edifice was built on Queen Street. Old record books of the “Canada Methodist Church, Beamsville” show the cornerstone laid that year and dedication taking place the next. Cordial relations with the Presbyterians are evidenced by the fact that John B. Osborne, a stalwart of Knox Church, was one of the principal speakers at the dedication ceremony. Wesley Methodist was a strong congregation, paying off steadily the indebtedness that accompanied each improvement to the building – acetylene lighting in 1898, electricity in 1912, a gowned choir, new organ in 1915, and a ready acceptance of the principle of church union in 1925. Beamsville, unlike Jordan, did not develop at the junction of a powerful creek and a major Indian trail. In fact, the earliest community did not occur at the future site of Beamsville at all but instead at the mouth of the Thirty Mile Creek. Without Jordan’s natural harbour, settlers at the mouth of the Thirty had to make their own harbour by building a jetty out into the lake. 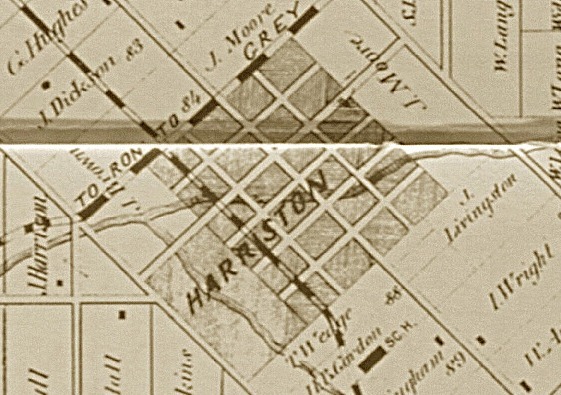 This little settlement came to be known as The Harbour and provided an early outlet for the grist and saw mills of western Clinton Township. It was never much of a harbour and in bad weather, boats had to moor out on the lake until better weather came along. When the Iroquois Trail began to be improved as the Queenston-to-Grimsby Road, another community began to develop around Jacob Beam’s land on the trail. This eventually became Beamsville. Two groups can lay claim to be the first settlers of the area. In 1786, a party of Mennonites and former Mennonites from Bucks County in Pennsylvania decided to emigrate to Canada. Loyalists in the Revolutionary War, they had decided that they would be better off in Canada. The group consisted of the families of Jacob Culp, his brother Dielman (Tillman) Culp, Staats Overholt, Frederick (or John) Haun, and, possibly, Conrad Tufford. Franklin Albright might have been part of that group or his family might have come the following year. 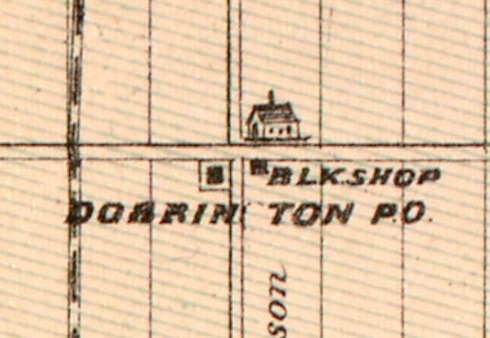 Records from 1791 show that Overholt owned the land on both sides of Ontario Street from Green Lane to the lake. Albright owned the land on which The Harbour developed at the mouth of the Thirty. Haun owned the land to the east of Overholt. Jacob and Tillman Culp and Tufford were still further east. Jacob Beam, a Baptist from New Jersey who had forfeited land during the war, had made an investigative trip to Canada in 1779. In 1788, he moved with his family to land he and his son, Jacob Junior, had been granted across the Iroquois Trail south of the Overholt and Haun land. Beam was a true entrepreneur and is credited with growing the first peaches on the Niagara Peninsula. It is also said that the first cheese made in Upper Canada was made with his milk. With Staats Overholt, he founded the Baptist church in Beamsville. He was also one of the founders of the first school on Academy Street. 1879 – In the fall of 1879, a plain white church building was errected on an acre of land that was purchased from Rev. Menno Bowman for $60.00, which is still the present church site. This church was called the United Brethren In Christ Church. The original plaque is located on the tower of the current church building. 1907 – On April 29, 1907 the United Brethern in Christ Church transferred the properties deed to the trustees of the The United Brethren Association of Congregational Churches. 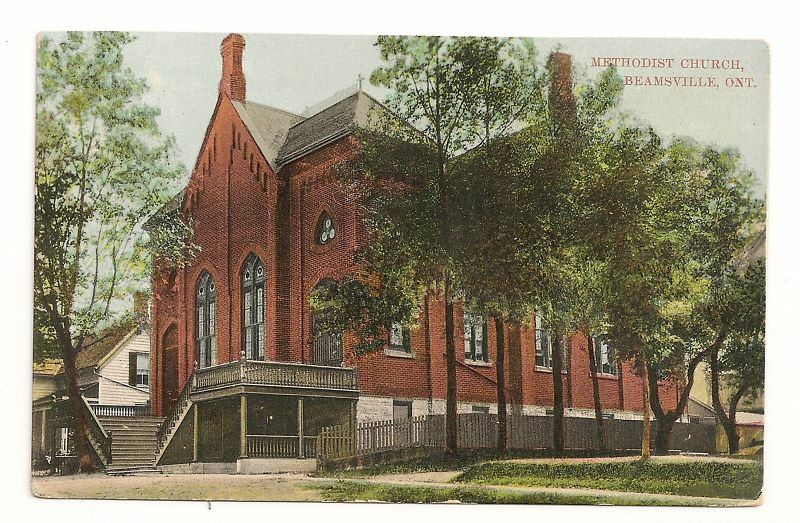 The “new” church was called the Congregational Church of Bloomingdale. 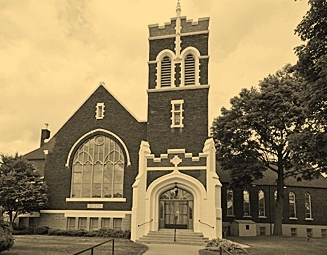 1925 – The Congregational Church of Bloomingdale became part of the United Church of Canada. At this point, the current church as it stands, was given the name Bloomingdale United Church. Petherick Bunt (1805-1881), of Yeovill, Somerset, England. He came to Canada in 1839, settling in Vaughan Twp., York County. 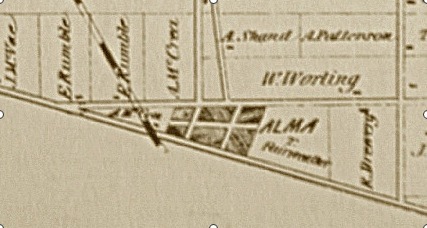 In 1848 he moved to Wellington Co. and settled near Alma, lot 16 S. conc. 9, Peel Twp.. He did carpentry work in first Methodist Church in Bloombury. …from Wellington County Museum and Archives – Photo 1912 (A1980.115) – Methodist Church Ladies in theatrical dress, ca. 1912 – Group of ladies from Harriston Methodist Church wearing theatrical costumes for presentation of the play ”A Ladies Aid Meeting at Mohawk Crossroads”. 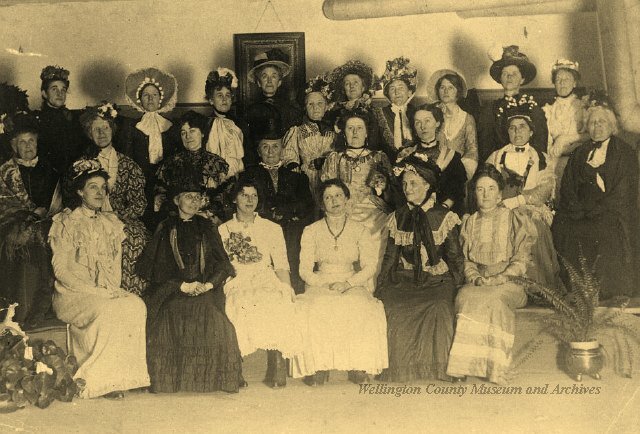 The play was written in 1890 and presented in 1912 at Harriston Methodist Church: left to right (back) Mrs. A. Fallis, Mrs. W. Berhns, Mrs. D. Harper, Miss A. McKee, Mrs. Martin, Mrs. A. Lambert, Mrs. E. Pritchard, Mrs. B. Whitmore, Mrs. C. Ranton, Mrs. J.J. Pritchard; (middle) Mrs. W. Beatty, Mrs. H. Lemon, Mrs. J. Crosson, Mrs. (Rev.) E. Bennett, Miss A. Spotton, Mrs. Plante, Mrs. Watson; (front) Mrs. Chapman, Mrs. Chas. Edgar, Mabel (Beck) Lambe, Mrs. Edgar Jackson, Miss Emma Jackson, Mrs. George Walkey.